Apple iPad Mini event confirmed for October 23rd – live from 6pm tonight | What Hi-Fi? We'll be reporting live from the Apple iPad Mini launch this evening, starting at 6pm UK time, so check back here on whathifi.com for all the latest news as it happens. Apple has confirmed an iPad launch event for Tuesday October 23rd. The new iPad Mini is expected to be announced, sporting a 7.8in screen. Up to 24 new iPad models could be announced in total according to the latest rumours, with iPads available in WiFi and WiFi+cellular options and with storage sizes of 8, 16, 32 and 64GB set to be available. A supposed price leak on a German blog suggests the most affordable Apple iPad Mini could come in at £200, presumably for a WiFi-only 8GB model. While previous generations being limited to 3G as a mobile network connection, rumours suggest the new iPads could have 4G LTE connectivity. The iPhone 5 was the first Apple product to offer 4G LTE speeds, provided you have the relevant network connection. In the UK, this means being on the new EE 4G network from Everything Everywhere, which is the UK's first 4G network. All the new iPads are also expected to have the new Apple Lightning connector, which created so much controversy at the time of the iPhone launch. Despite shifting huge numbers, the iPhone 5 launch has been far from plain sailing with one issue surrounding scratches appearing on the chassis. Reports suggest these production issues could still impact on supplying the new iPads. The rumour mill will no doubt ratchet up a notch over the next week but one thing's for sure: we will know the full details on the iPad Mini and new iPads on Tuesday October 23rd, with the event set to kick-off at 6pm UK time. Apple is likely to announce the iPad Mini on Tuesday October 23rd in time for a Christmas launch according to the latest reports. Respected technology website All Things D reports "people familiar with Apple's plans" saying it will be an invite-only event on October 23rd at Apple's Town Hall Auditorium. Many had expected invites to an Apple event for the launch of the iPad Mini to go out this week ahead of an event next week but the moment for that appears to have passed. 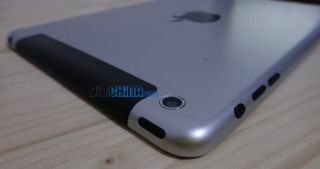 Unlike the iPhone 5, where most details were known in advance of the event, firm rumours for the iPad Mini are fairly thin on the ground. The size and price looks likely to be in a similar ballpark to the Google Nexus 7 tablet, with a 7.8in LCD screen being most people's guess with a price tag below £300. Thinner, lighter and with the new Apple Lightning connector, suggest All Things D, but for everything else we will have to wait and see. Mocked-up pictures have naturally flooded the net – see above for one from GizChina.com – but of course, nothing official as yet.